The soft and sweet "Evangeline" canopy is topped with a cascading overlay that's dotted with wonderful Holographic circles! The opening on the front is also trimmed with a ruffled and matching holographic circles edge. The pink fabric is sheer and just the perfect amount of frill for your little princess. The soft polka dots on top are holographic and reflect all of the colors of the rainbow, but look silver at first glance. 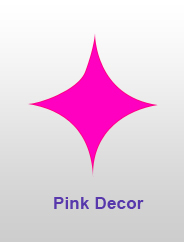 100% Polyester Netting-Pink , top folding metal ring 2' Ring Diameter, x 8.2' Length, x 39.4' Fabric Circumference. Mounting hardware included - We also offer a huge selection of matching accessories like beaded curtains and lamps that will really help you to tie the look of your room together!